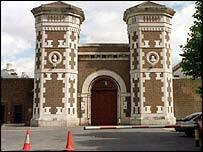 Wormwood Scrubs Prison has greatly improved after making fundamental changes since the last visit by the chief inspector of prisons. Chief inspector Ann Owers said that three quarters of inmates say staff treat them with respect - better than the national average. However, she also said in her report published on Tuesday there is not enough time spent outside cells. Only 36% of eligible inmates are involved in education or prison work. The west London jail housing 1,200 men has a troubled history. Accusations of mistreatment at the jail led to the biggest ever criminal investigation at a British prison, with 27 officers suspended from duty and prosecuted - three of whom were convicted. Following the allegations and investigation into the conduct of 100 officers, prisoners also won a number of civil claims. In September 2002, Ms Owers said the jail had "stalled", or was "sliding backwards" in areas that had begun to improve. Criticisms in her report at that time focused on a health care centre in an "appalling state", almost half of inmates questioned saying they sometimes felt unsafe in the prison, and an "ineffective" anti-bullying strategy. More recently, lawyers for the family of an inmate found hanging at the jail asked Scotland Yard to review the case. John Boyle, who was 27 and from Donegal in the Irish Republic, was found dead in 1994. An inquest jury returned an open verdict on the prisoner's death. He had been held in the segregation block, which was later the focus of an inquiry into allegations of beatings by prison officers.